Chevrolet offered a number of models in 1920, including the roadster, coupe, sedan and touring, as pictured. An inline 26-hp 171-cid 4-cylinder engine, or a 37-hp 224-cid 4-cylinder engine powered these cars, both coupled with a selective sliding gear 3-speed transmission. Options on the Chevrolet included front and rear bumpers, a spare tire, step plates, a Fat Man steering wheel, cowl lights, wind wings, an outside rearview mirror, and special paint. Engine Engine Configuration:	I Cylinders:	4 AspirationInduction:	Normal Displacement:	2878.00 cc or 175.6 cu in. or 2.9 L. Valves:	8 valves. 2 valves per cylinder. Horsepower:	20.00 HP (14.7 KW) HP to Weight Ratio:	70.0 LB HP (Vehicles with similar ratio) HP Liter:	6.9 BHP Liter Bore:	3.70 in or 94 mm. Stroke	4.00 in or 101.6 mm. Vehicles with similar horsepower and weight Transmission Information Gears:	2 Transmission:	Manual Dimensions Seating Capacity:	4 Exterior: Length:	134.001 in or 3403.6 mm. Wheelbase:	100.001 in or 2540 mm. 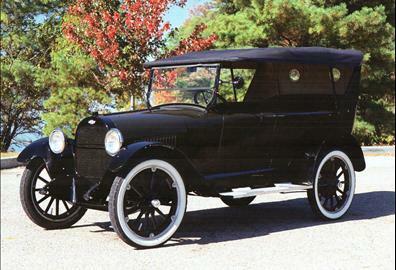 The Ford Model T has an extensive history in the automotive market lasting for nearly 20 years. It is often called the Tin Lizzie and the Flivver and is credited with putting America on wheels. During the early 1900s, the automobile was very new and the market place was adjusting to having these horseless carriages carry its passengers rather than bicycles or horses. Steam, electricity, and gasoline were the three means of powering the vehicles. Up until about 1915, no one really knew which would be the favorable power-source. Steam provided many benefits such as being quiet, clean, and cheap. Gasoline or kerosene fuel was used to heat water in a boiler; the steam produced was channeled to the cylinders, where the pressure drives the pistons up and down. The shortcomings were that it took a while to start, having to wait for the steam to prepare. It was dangerous, often exploding and causing injury. It had a limited range, lasting about 20-40 miles before requiring a refueling. Electricity was popular but it too had a limited range. It was easy to start and was very popular with the ladies for driving around town. Then there was gasoline, which was dirty and hard to start. It required fueling stations which were sometimes difficult to find in this new and evolving marketplace. The main benefit of the gasoline engine was that it had the most potential and an ever increasing amount of power. It was said that how a vehicle finished on the race track often determined the success of sales. With gasoline engines winning most of the races, the other sources of power were eventually doomed.